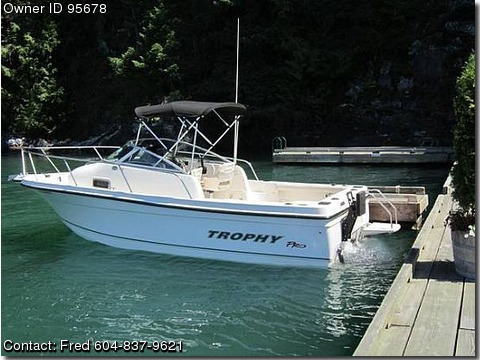 Contact the owner Fred @ 604-837-9621 or fredbauder(at)bcit(dot)ca.Moving to the interior, must sell. Rare Cummins turbo diesel(1.7 litre four valves/cylinder,double overhead cams intercooled,120hp inline 4 cylinder with Merc. gears and leg. Easily cruises at 25 knots at 4400rpm with full load. Sleeps two, on board toilet with holding tank. Hull(whose design is exclusive to this diesel engine) is in mint condition as is the bridge and below deck. New button down enclosure water seals the bridge and lower deck. No tears on cushions and seats. Professionally maintained, all records since 2009. Updated GPS for west coast locations. Fish finder, Two brand new Scotty electric down riggers(short). Two axle trailer has four new tires and spare. Two brand new Scotty downriggers(shorts). Crooks and triflers need not respond. 24,950 obo, 604-530-3896.